My husband Dave’s season of ball with the Manitoba Senior Slow Pitch Tournament League is over and his Eastman team has emerged champions. Normally that would mean that Dave’s Monday and Wednesday mornings could now be devoted to pickle ball instead of soft ball but….. this year he is also playing in an international tournament in Utah in October so some of his pickle ball games will have to be prempted for practices to prepare for that big event. Dave has been playing ball since he was about four years old and was part of the Sunday School league at his church in Leamington Ontario. That’s about sixty years of the sport and if he keeps this up someday it might even be seventy! 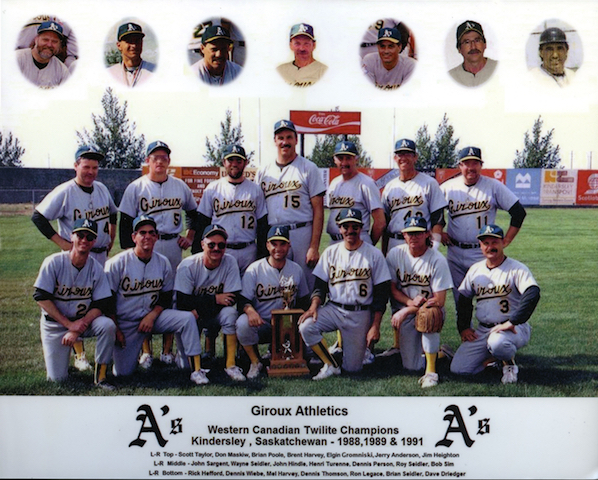 In 2009 The Giroux Athletics were inducted into the Manitoba Baseball Hall of Fame. My husband Dave was a member of that team. He is #3 in the first row at the far right. On Friday members of the team gathered for a golf game and reunion meal with quite a number of the senior players bringing along their sons for the round. Dave was happy to have our son join him on the links. 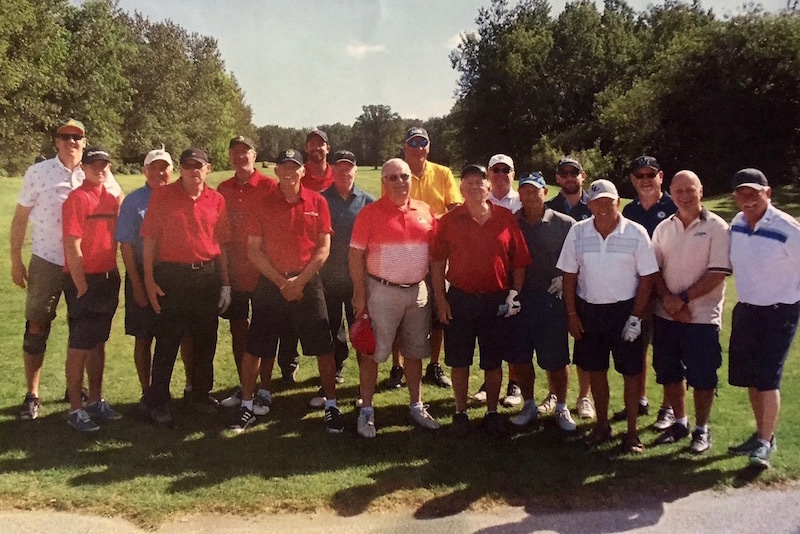 The group posed for a photo before they teed off. For one afternoon the Giroux Athletics were together again. We decided on the spur of the moment to go to the Goldeyes game on Saturday night. We just live a couple blocks from the stadium and thought we’d pick up a couple of tickets at the box office just before the game. Were we ever surprised to see a very l…..oooong line up of people waiting to get tickets. The reason the game was so popular? 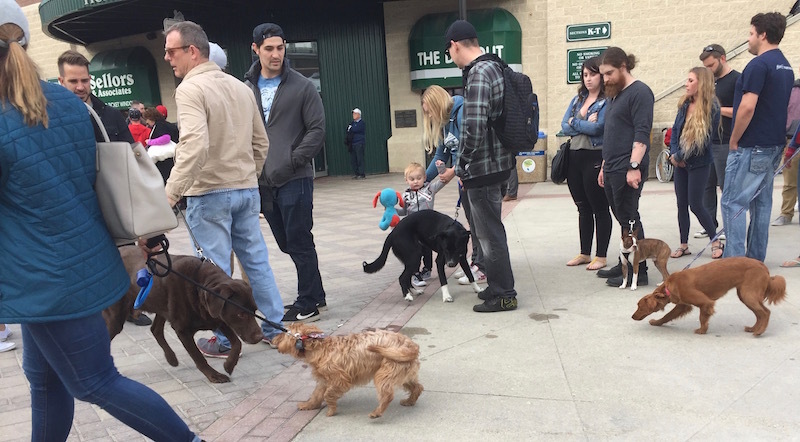 It was Bark in the Park night. 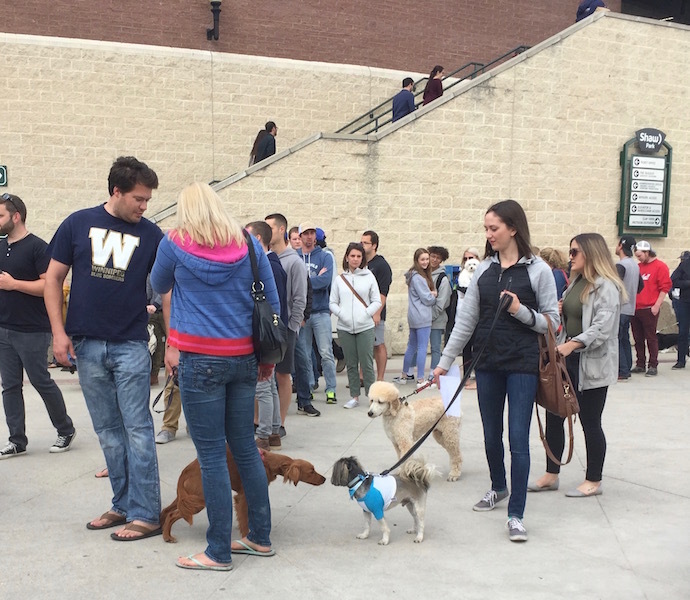 Fans were encouraged to bring their pooches to the game and they were lined up to get their dogs’ complimentary tickets and their ‘doggie bags’ of treats. I found it fascinating to ‘dog watch’ and ‘people watch’ as we waited for a chance to buy our tickets. 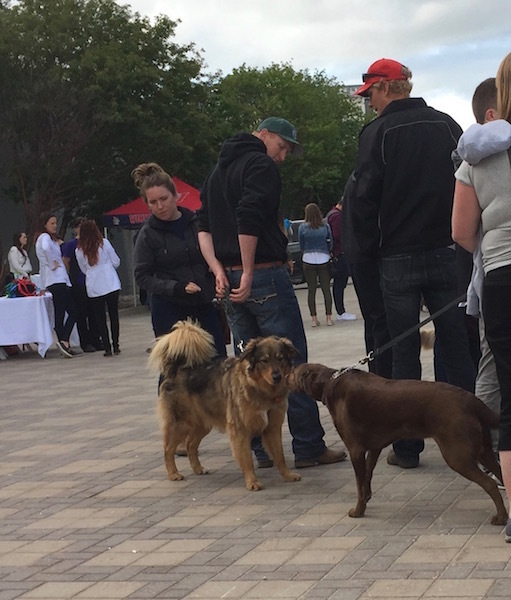 It was interesting to note the many different kinds of dogs, the many different ways people interacted with their pets and the way the dogs interacted with each other. 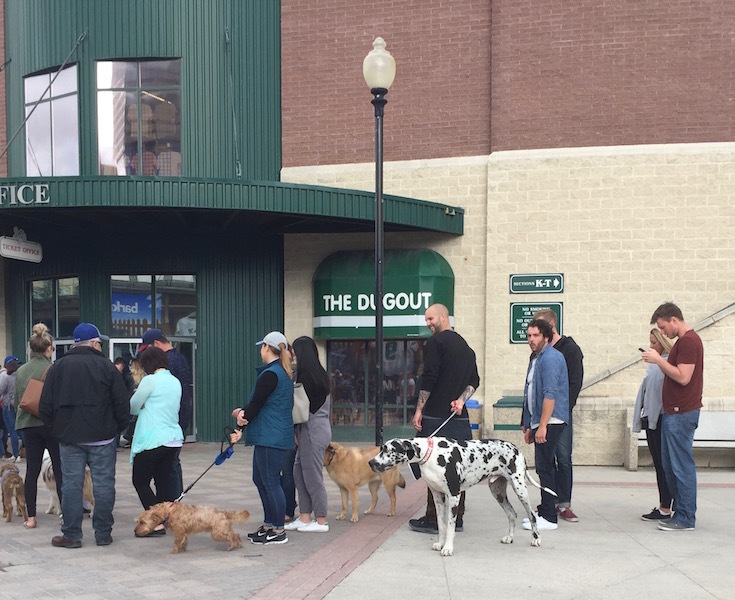 The Goldeyes were trying to set a world record for most dogs at a ball game established by the Chicago White Soxs last year at 1,123. 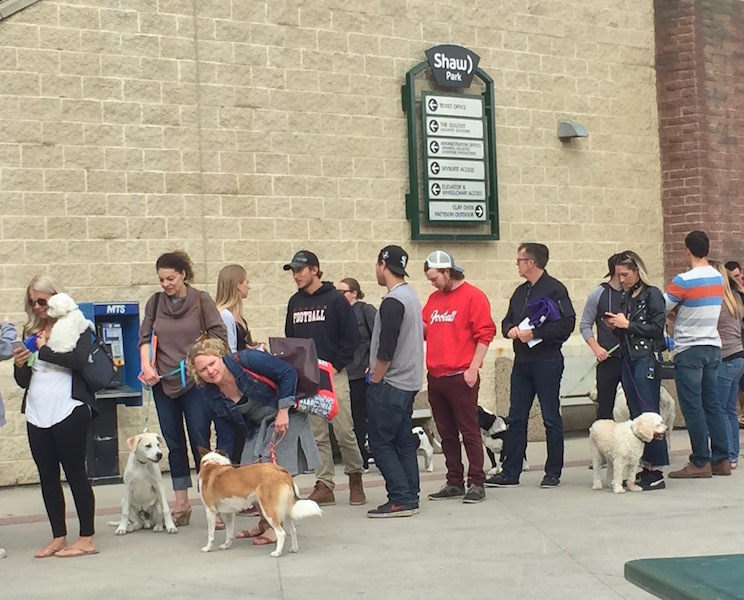 Saturday night the Goldeyes only had 852 dogs registered, but that was still an awful lot of dogs. I’ve been to lots of Goldeyes games but this one was certainly the most unusual. The alarm rings just after six. We are on vacation. Why are we getting up so early? Right! My husband Dave has a ball game at 8:30 am. It is a forty-five minute drive away. We need to get dressed, stop for coffee, leave enough time to be sure we can find the diamond and be there early so he can warm up. I am going along because after Dave’s doubleheader we are off to the airport to pick up my brother who is arriving from Winnipeg. My husband Dave joined a slow pitch ball team for our two months here in Arizona. Many of his teammates participate in the same summer league as he does in Manitoba, although some of his fellow players are from other provinces. During the game I sit with another player’s wife who is from Edmonton. There is a large slow pitch league here in the Phoenix area for seniors who love the game and want to play year round. In fact Dave tells me there are so many different opportunities to play ball here that some of the guys on his team have games practically everyday. Dave is just playing on Tuesdays but he does have a couple of weekend tournaments as well. We witness a beautiful sunrise as we drive to the ball park inside a huge Trailer Resort that boasts a state of the art diamond. Dave tells me the diamonds here are pristine, in much better shape than any he plays on in Winnipeg. 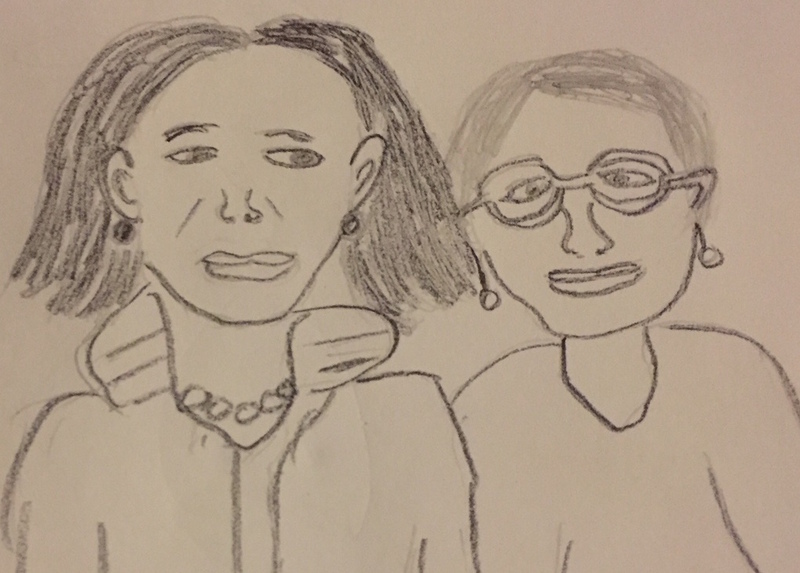 I have a nice visit with two other women who have come to watch our team play. They give me tips about good places in the area to shop and eat. The sun is warm and I have fun trying to take some good photos of Dave through the wire fence. He has a couple great hits and does a dramatic dive but just misses a catch in the field. The other guys compliment him on his fast running and I hear them calling him DavieD a baseball nickname I have heard hundreds of times since I have been watching him play ball now for over forty years. After the game we have time for breakfast together before heading to the airport. It’s not so bad getting up early even if you are on vacation. Dad on one of the ball teams he played for. He is on the far left in the back row. His brother John is fourth from the left in the back row. One of the legacies my father-in-law left his family is a true love for the game of baseball. In these last few days as we’ve gathered to mourn Dad’s death many of the stories we’ve told revolve around Dad’s passion for the game. Dad was an excellent player himself, a good hitter and savvy infielder, skills that some say could have taken him to the major leagues. He coached baseball and he even started a Sunday afternoon baseball league for kids in the large church where he was the Sunday School superintendent. After a full day’s work in the tomato field the five boys in the Driedger family were never too tired for an after supper ball game. Our son at age six ready for a Tigers game. Trips to a Tigers game in nearby Detroit were an annual treat for Dad and his sons, and they went early to line up along the field during batting practice hoping for a chance to catch a foul ball or a home run ball. When our sons were small a Tiger game with Opa was also a special treat during our visits to Ontario. 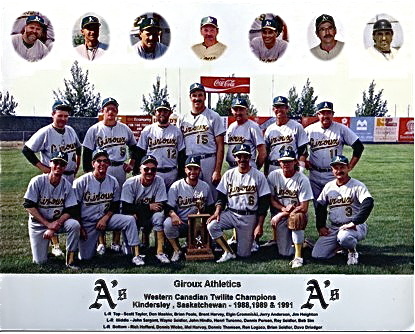 My husband Dave on the Manitoba fastball team at the national championships in New Brunswick in 1978. Dave is to the far right in the first row. This love of the game was inherited by subsequent generations. My husband Dave and his brothers all played ball for many years as adults. Most of the Driedger grandchildren love the game too. Both our sons played baseball right through highschool and one even worked for a time as an umpire. And now the love of the game has passed to yet another generation. On Thursday night after our family had spent more than seven hours at the funeral home greeting the hundreds of people who had come to pay their last respects to Dad, we arrived back at my brother and sister-in- laws’ house to make the final arrangements for the funeral the next day. It was getting dark, but Nash, one of Dad’s great-grandchildren called out to my husband Dave, “Uncle Dave you want to play catch?” What could Dave say? So Nash went to find a ball and gloves and in the twilight he and his great-uncle tossed the ball back and forth in the backyard. I think Dad would have smiled to see them. I slept with a champion last night. Dave and I were in Bemidji Minnesota for the weekend where he was playing in a baseball tournament. 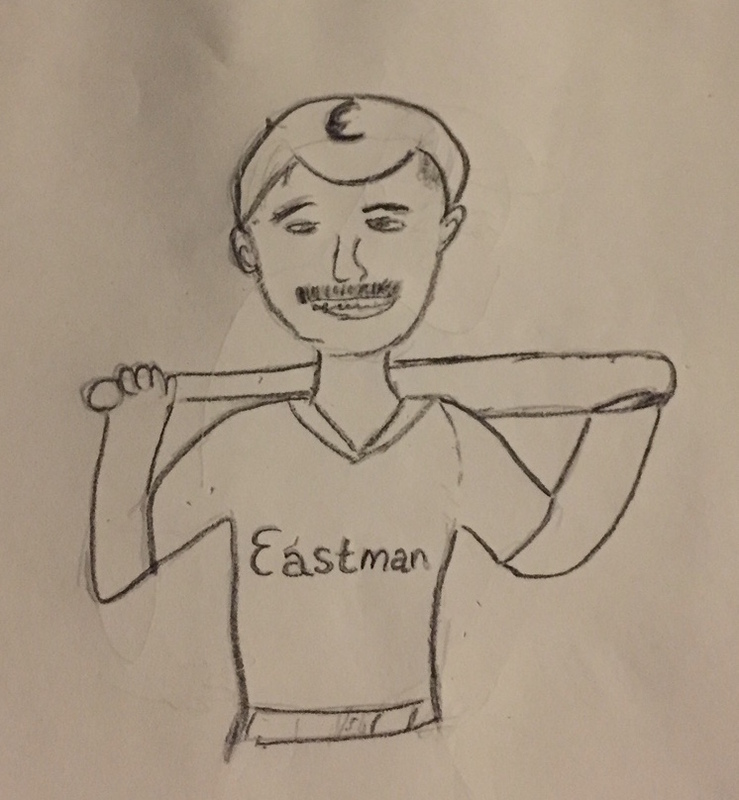 Although the road to victory wasn’t easy his Eastman team won the championship on Sunday in fine style. Dave made a great catch that had him jumping high in the air. He had some solid hits and managed to avoid irritating the leg wound he got on Saturday diving for a ball. Dave has been a champion baseball player many times before. In fact he is in the Manitoba Baseball Hall of Fame. But he is a champion in lots of other ways in my books. After the final game yesterday he drove all the way home from Bemidji so I could work on a writing project in the car that has a fast approaching due date. Then when we got home he made me his signature spicy Caesar cocktail and a homemade pizza for our supper. Today he’s headed off to train for a new job as a Lexus driver to earn some extra cash for our travel adventures. I guess I sleep with a champion every night. Other posts about baseball in Bemidji…..